For many editors, Apple QuickTime Player Pro (not QuickTime Player X) has been their go-to media player and encoding application. Since this is a discontinued piece of software and Apple is actively deprecating QuickTime with each new version of Mac OS X, it stands to reason that at some point QuickTime Player Pro will cease to function. Telestream – maker of the highly-regarded Episode encoder – plans to be ready with Switch. Switch will run on Mac and Windows platforms and has steadily gained features since its product launch. (It is currently in version 1.6.) Switch is a multi-function media player that comes in three versions: Switch Player – a free, multi-format media player with file inspection capabilities; Switch Plus – to play, inspect, and fix media file issues; and, Switch Pro – a comprehensive file encoder. All Switch versions will play a wide range of media file formats and allow you to inspect the file properties, but only the Plus and Pro paid versions include encoding. Building on its knowledge in developing Episode and its tight relationship with Apple, Telestream hopes to make Switch the all-purpose encoder of choice for most editors. The intent is for editors to use Switch where they would normally have used QuickTime Player Pro in the past. 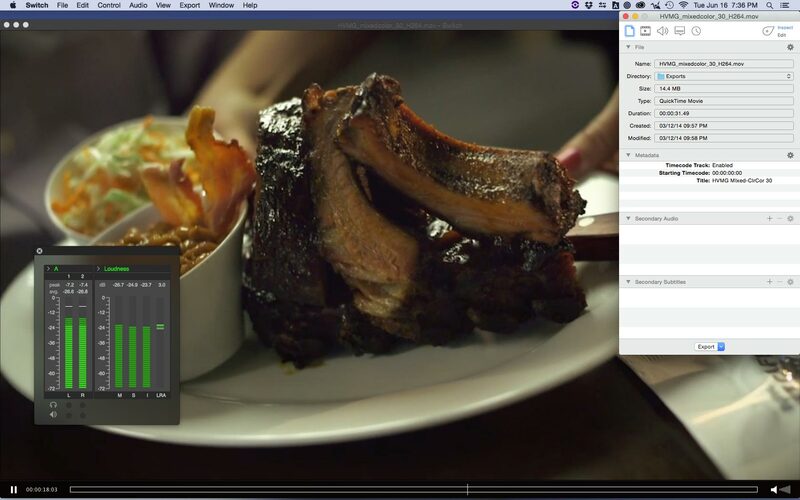 Unlike other open source media players, Telestream can play many professional media formats (like MXF), display embedded captions and subtitles, and properly encode to advanced file formats (like Apple ProRes). Since Switch Plus and Pro are designed for single-file processing, instead of batch encoding like Episode, their prices are also lower than that of Episode. While the playback capabilities of Switch cover many formats, the encoding/export options are more limited. Switch Plus, which was added with version 1.6, can export MPEG-2, MPEG-4, and QuickTime (.mov) files. There’s also a pass-through mode in cases where files simply need to be rewrapped. For example, you might choose to convert Canon C300 clips from MXF into QuickTime movies, but maintain the native Canon XF codec. This might make it easier for a producer to review the media files before an upcoming edit session. Switch Plus also adds playback support for HEVC and MPEG-2 on windows, AC3 audio, and pro audio meters that display tru-peak and momentary loudness values. Switch Pro includes all of the Plus features, as well as playback of Avid DNxHD, DNxHR, and JPEG 2000 files. It can encode in QuickTime (.mov), MPEG-4, and MPEG-2 (transport and program stream) containers. You can also export still frames and iTunes Store package formats. Codec encoding support includes H.264, MPEG-2, and ProRes. (ProRes export on Windows is ProRes HQ 4:2:2 for iTunes only.) While that’s more limited than Episode, Telestream plans to add more capabilities to Switch over time. Switch Pro is more than an encoder, it also includes SDI out via AJA i/o devices (for preview to an external calibrated device), loudness monitoring, and caption playback. Even the free Player will pass audio out to speakers through AJA cards and USB-connected Core Audio devices. Unfortunately this does not appear to work when you have a Blackmagic Design card installed. Telestream has acknowledged this as a bug that it plans to fix in the 2.0 release later this year. The goal for the Switch product line is to be a powerful and affordable visual QC tool, that you can also use it to make corrections to metadata, formats, audio, etc., and encode to a new file. Along with the usual inspection of file properties, Switch includes a set of audio meters that display volume and loudness readings. Although it does not offer audio and video adjustment or correction controls, you can re-arrange audio channels and speaker assignments. Telestream Switch is a very useful encoder, but if you just need a versatile media player and inspection tool, then you can easily start with the free player version. This entry was posted in apps-gear-filters and tagged compression, workflows.